Congrats to four of our Arena Ready members who took their Level 1 trainer course this past weekend at Pacific Strength. Angela, Megan, Brian "B-Dom" D., and Jason E. all went through the trainer course and represented AR as their usual awesome selves. 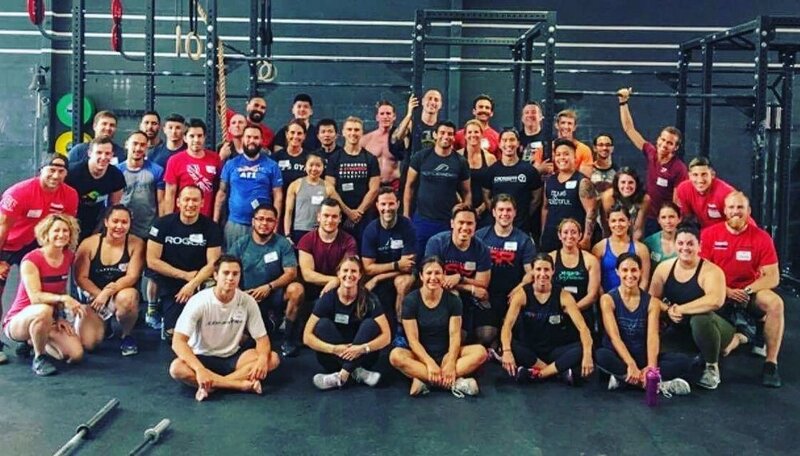 For Jason it was his second time taking the Level 1 (he was renewing his credential), as he took his first Level 1 course nearly five years ago (and Coach Sarah was one of the CrossFit HQ Head Trainers teaching that seminar!). It's pretty cool to think about just how many AR members also have their Level 1 trainer credential - we probably have 30+ in our little crew which is quite the percentage of our gym's presence. Our community benefits immensely from how many amazing individuals actually care about CrossFit (as it's intended to be done), health, fitness, and helping others around them. Gotta LOVE those four Arena Read shirts front and (sorta) center/right-ish! Last week we did a very similar complex on a 12-minute clock but with push jerks - this week it's push presses. Focus on driving the barbell with the legs and then finishing overhead by pressing, and NOT re-bending underneath the bar (squeeze your glutes and quads until the bar has reached full lockout overhead). Push presses means no re-bend of the legs when receiving the bar overhead - those are called jerks. If you find yourself struggling to actually push press the barbell, particularly if you have a hard time not re-bending your legs, then scale accordingly so that you can do the written movement. Yes, it's harder to push press in this workout - that's the point. Enjoy!